One of the companies owned by billionaire British entrepreneur Sir Richard Branson is in talks with the A.B. Won Pat Guam International Airport Authority to launch commercial satellites into space from Guam. GIAA has been working separately with the Honolulu District Office of the Federal Aviation Administration to obtain a commercial spaceport license. 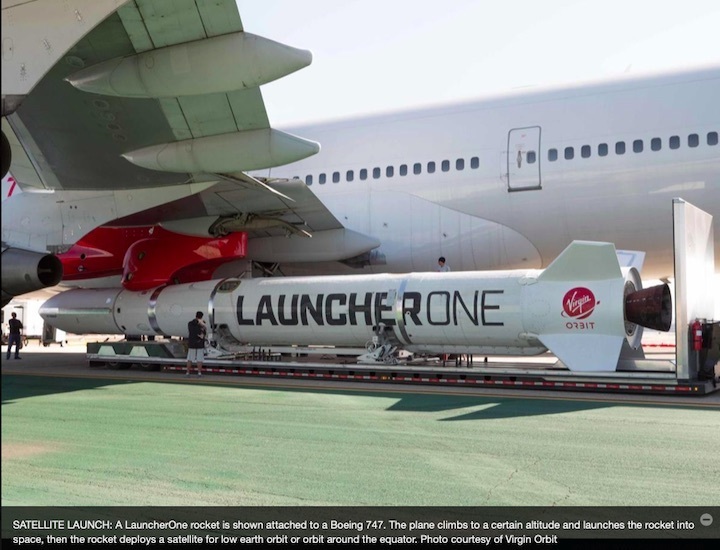 Virgin Orbit was formed in 2017 to develop the LauncherOne rocket. The company is based in Long Beach, California, and has more than 300 employees. Virgin Orbit President Dan Hart is a former vice president of government satellite systems at Boeing Co.
A rocket launch pad on Guam is not under consideration. Instead, what Virgin Orbit plans to do is place a small satellite in its LauncherOne rocket and attach the rocket to the underside of a Boeing 747’s wing. The plane would then climb to a certain altitude and launch the rocket into space where the satellite would be deployed. According to SpaceNews, the first test flight of the LauncherOne air-launch system took place on Nov. 18 in Victorville, California. Guam has attracted Virgin Orbit’s interest because it is close to the equator. The Virgin Orbit website includes a graphic showing three launch sites – one in the Mojave Desert, to be used to place satellites into a polar orbit; another launch site in Florida, to launch satellites into medium earth orbit; and a third site, listed only as “an island in the Pacific,” to be used for satellites intended for low earth orbit or orbit around the equator. “We’re hoping (Virgin Orbit) will establish a presence at the Guam airport,” Ada said. That could mean leasing a hanger and basing Virgin Orbit's launch plane here. Ada declined to speculate on the financial impact and said no final agreement has been reached. “We’re doing environmental feasibility studies at this point,” said Ada, and submission of the spaceport application to the FAA is still about three months away. Approval by the FAA could take another six months.